You can connect with Mr. Charyn on his website, facebook and twitter. My thoughts: Let me start by saying that while I enjoy reading poetry, I have never taken it upon myself to learn anything about any of the great poets - so I have no point of reference to tell you whether or not this fictionalized account of Emily Dickinson's life and the characters she encounters are real or not. Now I feel like I can tell you how I found the book. 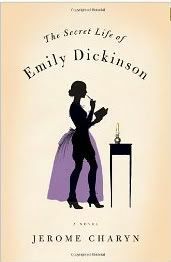 The book in not written in a "modern" tone, but rather in Emily's voice as it would have been in the 1800's. This gave me a sense of being in the time and helped paint the picture of her life. From the start of the book, where she was a student at Mount Holyoke, studying to be a "bride of Christ" to the end of her life, she continued to have a fascination and secret yearning for Tom, the handyman at the school. He turns up throughout the book in various ways and in various people. The story also includes her brother Austin, little sister Lavinia, her father (whom treats her as daughter, wife, servant, in various episodes throughout her life) her sister-in-law Sue, and school mate Zilpah - who is sometimes her friend and sometimes her nemesis. I found it to be an engaging read, but I did have to be in the right mood to read it. What it has done for me, is make me want to go find a "real" biography of Emily Dickinson and learn more about the real lady! For more reviews - check out the book's blog tour site. The Secret Life of Emily Dickinson also has a Facebook page and Twitter account. The Paris Wife by Paula McLain - Book Giveaway!! !